1 Project Ghiblis are worth between £6000 and £10,000, but be warned that parts are scarce. Better to pay more for a runner or £15,000-£20,000 for something really nice. The best non- Cup spec Ghiblis are worth £25,000- £30,000. 2 Of 26 RHD Cups there are 24 survivors. A roadworthy one for under £30k is doing well. Good ones are at least £40k. Superb Cups are £50,000 to £60,000. Left- or right-hand-drive Cups are worth the same, but other LHD models are worth 10% less in UK. Few marques have the Maserati’s cachet, yet for years many of its cars were worth surprisingly little. More recently, values of the company’s pre-1980 models have surged but there’s one great that remains affordable, and that’s the Ghibli II, which evolved from the Biturbo. However, while Biturbo values continue to languish, the Ghibli is starting to gain traction among collectors and values of good examples are likely to rise further. Owning any Biturbo derivative can be a scary proposition thanks to tales of horriic unreliability and appalling parts availability. But the Ghibli was the most thoroughly developed of all; used regularly and maintained properly, it shouldn’t be inherently unreliable. Parts can be very costly and are in short supply, but most bits can be tracked down if you search hard enough. While ownership is definitely a commitment, it’s worthwhile because the Ghibli is fabulous to drive, searingly quick and eminently practical too. This guide pools specialist advice from Andy Heywood of McGrath Maserati (mcgrathmaserati.co.uk), Mark Donovan of restorer Prestige and Performance Car Services (prestigeandperformancecars.co.uk) and Marios Kriticos of Autoshield Maserati (autoshieldmaserati.co.uk). It’s the running gear that separates the truly desirable Ghiblis from the more prosaic. Around 2300 Ghibli IIs were built and about 150 came to the UK. Italian-market cars got a 2.0-litre V6, which is more powerful than the 2.8-litre unit in UK cars but it’s not as torquey (275lb ft instead of 305lb ft); the smaller engine’s rev limit is 6750rpm instead of 6250rpm and needs revving – that suits some owners and not others. Ghibli II The two-door coupé, Ghibli II went on sale in Europe in 1992 with a twin-turbo 306bhp 2.0-litre V6; UK sales started two years later but RHD cars got a 284bhp 2.8-litre V6. These cars feature 16-inch, seven-spoke alloy wheels and have no anti-lock brakes. Ghibli ABS From 1995 17-inch wheels were fitted (with a new design) along with Bosch anti-lock brakes. Ghibli Primatist Built to commemorate the world water speed record, which was broken by a speedboat powered by a Ghibli biturbo V6. Launched in 1996 and mechanically standard, the 35 Primatists have a 306bhp 2.0-litre V6, blue paint and a two-tone blue leather interior. 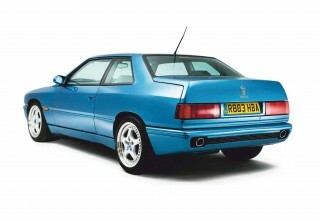 Ghibli GT Launched in 1996, it has a new rear axle from the Quattroporte and Ferrari 456. The rear suspension features tubular lower wishbones from the Ghibli Cup racers; pressed-steel trailing arms were previously fitted. The Getrag five-speed manual gearbox was superseded by a much sweeter Getrag six-speeder; the four-speed auto was still an option. A new seven-spoke, 17-inch alloy design was fitted. Build standards were far higher than on earlier Ghiblis. Ghibli Cup This 330bhp 2.0-litre V6 special celebrated the single-make Ghibli Open Cup race series. Just 86 road-going cars were built, 26 right-hand-drive, and are the most sought after. Each has Brembo four-pot brakes with drilled discs, lower, stiffer suspension, 17-inch five-spoke split-rim Speedline alloys, a modified engine management system and a more free-lowing exhaust. Inside, carbonfibre replaced the wood and there are drilled pedals plus a smaller Momo Corse steering wheel. The chances of buying a Ghibli with crash damage or corrosion are high and panel availability is very poor. Rot can lurk underneath the sill covers; putting this right can easily cost £6000- £10,000. The grille underside (which is part of the bonnet) is double skinned and rots out, while the A-pillar covers cut into the top of the wings. The two rub together, removing the paint which triggers rust. Also, check the roof’s trailing edge because rust is common just above the rear window. The chassis rails under the bulkhead are weak, rust-prone and distort easily if bashed; even a relatively light knock to a front wing can lead to distortion, but it can be repaired. Engine The Ghibli’s V6 engine is a development of the last Biturbo unit, the later four-valve quad-cam 222 and 430. Each bank of cylinders got its own ECU and there was direct injection for all but earliest examples. Despite the V6’s complexity it’s tough if service intervals are adhered to. Rebuilding or replacing the Biturbo’s twin-turbo V6 can cost £10,000-£12,000 (when parts are available), so get an expert check. A decent secondhand engine (if you can find one) costs at least £5000. Radiators are poorly made so budget £420 for a reconditioned unit. Alternators fail and a reconditioned one is £180. The two water-cooled IHI turbochargers are generally problem-free. Once the engine is warm, let it idle for ten minutes and watch for blue exhaust smoke. If there’s any the turbos need replacing – pay £1440 for two new turbos and same again for labour; there are no parts to recondition them. The Cup comes with roller-bearing turbos to cope with the extra boost needed to generate 165bhp per litre. They’re reliable but check for blue exhaust smoke because replacements cost £5000 apiece. Exhaust Catalytic converters hang low – especially on cars with 16-inch alloys – so they do get bashed. Get an MoT test done to check emissions, and budget £780 per side for replacement cats if they’re available. A new stainless steel exhaust with cats costs around £2500. Exhaust manifolds crack and replacement entails engine removal to either weld or replace – budget £1k-£2k. The first Ghiblis were offered with Getrag five-speed manual or four-speed automatic gearboxes. While the auto was initially more popular, within two years the situation had reversed with three out of four Ghiblis getting a manual box. 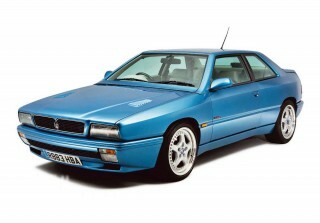 The six-speed manual that came later is the same transmission fitted to the contemporary Quattroporte and BMW M3. Early Ghiblis feature a Torsen differential with an oil cooler; the GT and Cup had a Ferrari-sourced unit, without a cooler. The early diff was from the Biturbo, but being under more strain from the extra torque, the cooler is there to help protect it. It’s fitted under the diff so is easily bashed; check it’s intact because if it’s leaking, failure is guaranteed sooner rather than later. New ones aren’t available but used ones crop up. Back plates weren’t fitted to the front discs so they can corrode and you can’t currently get new ones, though batches do get made. Genuine pads cost £312 or £132 for pattern parts. The Ghibli came with electronically adjustable dampers with four ride settings. Although this was a delete option you’re unlikely to find one without them and while they’re effective they tend to suffer from leaks and seized motors. They’re expensive to replace at £780 apiece for the front, but the rears aren’t available. Bilstein can rebuild them at £420 a go. Interior & electrics The Ghibli’s electrics are better than the Biturbo’s, especially from the GT onwards. Check everything works, especially the heating and ventilation system. Press the auto button and make sure everything lights up. If not it could mean £320 for a reconditioned LCD panel; you can’t get new replacements. The compressor and condenser do fail but can be reconditioned. Also ensure headlights are not damaged because replacements aren’t available. All Ghiblis came with leather trim, which wears well apart from the driver’s seat bolsters but can be recovered. The dashboard leather can shrink and fixing it requires dash removal. The wood trim lasts well if kept dry, but the Cup’s carbonfibre trim can fade and the lacquer goes milky. It can be rewrapped. Maintenance It’s essential the service schedule has been adhered to. Check it’s had an oil change every 6000 miles and timing belt replacement every 24,000 miles. Belt change is £500-1000 and it’s around £1700 with a service too. Make sure synthetic oil has always been used – anything else isn’t up to the job. Each service up to 96,000 miles is different but the big one is at 48,000 miles as it’s an engine-out to replace the inlet cam’s drive chains – typical bill is around £3000. All Ghiblis share the same metalwork but it’s the running gear that seperates the standard from the ultimately desirable. Ghibli was fitted with a twin-turbo V6 and was a development of the Biturbo. Standard UK Ghiblis came with the 284bhp 2.8-litre V6, not the 2.0-litre unit fitted to Italian-market cars. Driver’s seat bolster cushions tend to wear but these can be retrimmed. Key to happy Maserati Ghibli ownership is choosing carefully, getting expert advice, and ensuring that fully documented service history shows it’s been properly maintained. John Bennett is the Maserati Owners’ Club chairman and has owned his Ghibli Cup since 2014, ‘I had a Sebring that broke down and the then-chairman transported my wife and I to lunch in his Ghibli. I was struck by how usable the car was and eventually I bought that very car. ‘I don’t do a lot of miles each year – maybe 1500 – but I enjoy every one. I took my Ghibli to Biarritz and it was perfect; it’s great for long-distance drives because there’s so much performance, the boot is big and you can it four inside, although it’s a squeeze if they’re all adults. The driving position is a little awkward but you adapt to it. ‘The Ghibli is a perfect B-road car. In third gear it goes like a rocket and the handling is incredible. The adjustable suspension is best left in Road mode, but if you’re on track the Sport setting really stiffens things up. Douglas Lowndes owns the Ghibli in the pictures, having bought it in 2011. Says Douglas, ‘I bought a new Gran Turismo in 2008 and I started looking at the classics. I talked to owners and soon realised the Ghibli offers phenomenal performance and excellent roadholding, even by modern standards. You have to be careful with the power in the wet; it’s easy to spin the wheels when pulling away, even in the dry. ‘My car has more than 80,000 miles but the engine is very strong. The car has only needed routine maintenance so far. The key is to invest some money when you buy one; when I bought mine I got McGrath Maserati to go through and sort it while the parts were available. I’m glad I did because parts availability has become a real issue. I budget about £1000 each year on maintenance. ‘The Ghibli is usable in that it’s got a big boot, space for four or five and it’s not a thirsty car – I can easily get 28mpg on a run. The Maserati features the typical Italian short legs/long arms driving position, but it’s possible to extend the steering column if this is a problem. John Connor, Harrogate, Yorks John Connor bought his first Ghibli Cup in 2001 then another in 2007 to keep the miles of the first one. Says John, ‘They’re very usable because I can carry my four children at the same time and swallow huge distances with ease. I do about 3500 miles each year in one and 6500 in the other. ‘I feel totally connected because there’s no electronic gadgetry. The engine is tractable, the power goes to the rear wheels and I’m doing the driving, not the car. 59,600 miles, deep blue with grey leather interior. Comes with full history, all MoTs and road fund tax discs. Has had a recent cam belt service and has been serviced by Maserati specialists, Meridien and McGraths. It’s one of the 26 UK Cup cars and is described as ‘a very rare opportunity to purchase a Ghibli Cup in such fabulous condition. First to see will buy.